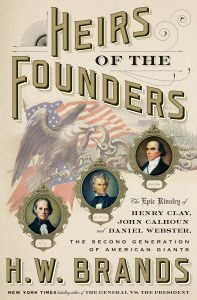 Henry Clay (1777–1852), John Calhoun (1782–1850), and Daniel Webster (1782–1852) all wanted to be president. Clay, leader of the Whig Party, seemed like the best bet. He had settled in Kentucky, then considered the cutting edge of the advancing West, and he drew his strength from all areas of the country. He had worked mightily to preserve the Union, balancing the powers of the Federal government and the sovereignty of the several states in the Missouri Compromise (1820) and the Compromise of 1850—both efforts to legislate a peaceable modus vivendi between the thriving North and the curtailed agrarian South, which saw its political might and slave economy threatened by the free-soil labor of the expanding West. Like James Madison and other Founders, Clay, himself a slaveholder, believed that slavery would die out. He regretted its existence, and after his death he made provision for freeing his slaves, but, like Lincoln before the Civil War, Clay resisted trying to legislate slavery out of existence, dreading that such abolitionist efforts would wreck the Union. Clay’s temporizing—built on a belief that avoiding conflict above all, would preserve the Union—might have succeeded if not for the brilliant maneuvers and policies of John Calhoun. Calhoun was not merely a staunch defender of slavery as an economic necessity but a promulgator of the peculiar institution as a positive benefit to mankind. The history of civilization depended, he argued, on the superior races taking care of inferiors, giving them full employment and looking after their needs in a most benevolent fashion. Calhoun encouraged a generation of Southern apologists, which, surprisingly, H. W. Brands does not mention in his new Heirs of the Founders. The fault of biography is that it sometimes accords too much agency to individuals, or does not situate those individuals into a social context out of which they arise and influence their fellows. This singular focus on Calhoun makes the book a vivid clash of personalities but less satisfying as history and as a record of how Calhoun became so successful. In other words, how did the South, following Calhoun’s lead, so easily cross over from Madison’s regret that slavery existed at all to a full-bodied celebration of servitude? Calhoun had served as Vice President, and until his uncompromising championing of slavery, seemed a likely presidential candidate. He had the eloquence and the intellect to mark him as a worthy heir of the Founders. But then he put that powerful mind to work on doctrines like nullification that, in effect, turned the Constitution back into the Articles of Confederation. He believed that a state could nullify a federal law because the states were sovereign. Clay rightly objected, saying the nullification doctrine made any concept of a Federal government unworkable. Opposing Calhoun meant that Clay lost the South’s support, and then saw his presidential hopes dashed by the advent of Andrew Jackson, hero of the War of 1812 and a champion of a people’s democracy that made Clay’s senatorial maneuvering seem merely the play of politics. Later, James K. Polk developed an agressive attitude toward American expansion in Texas and California that made Clay seem even more timid. Into this mix add Massachusetts senator Daniel Webster, who stood as the champion orator of his day, the defender of the Constitution, and the colossus of New England mercantile interests. The power of his rhetoric could almost sway those beyond his region, except for the South because Massachusetts produced so many abolitionists. Webster did his best not to offend the South and to respect Calhoun’s positions. Like Clay, preserving the Union was paramount in Webster’s thinking. But whatever Webster did, Calhoun stood in the way. Brands might have made more of this dynamic tension. Calhoun insisted on the right of secession. If Calhoun had not been so adamant and dominant, a more wily Southern politician might have finessed the conflict between the South and the North. This, in fact, is what Webster seems to have been looking for when he came out in support of Clay’s Compromise of 1850. Webster outraged his own supporters when he supported Calhoun’s demands for stronger enforcement of the fugitive slave law, making it more feasible for slaveholders to reclaim escaped slaves. A more pliable Calhoun might have given Webster some political cover if he had acceded to the Clay compromise. Webster would then have had an opening for a presidential run, since Calhoun was dying and Clay, in his seventies, felt weakened and no longer a contender. Here a biographer would explore more acutely the health of Calhoun and Clay and how their dissipating energies and Calhoun’s inflexibility contributed to the impending disaster of the Civil War. Brands mentions these factors but never really provides the concrete particulars that Samuel Johnson identified as essential to biography. Brands’s most brilliant stroke as a biographer is to interweave the story of Solomon Northrup, a free black drugged and dragooned into slavery. Northrup’s own account, written after he escaped twelve years of servitude, is expertly introduced to give the lie to Calhoun’s benevolent view of slavery. Brands never directly condemns Calhoun. He does not need to since he can use Northrup’s own words on the cruelty of slavery. The devastating human cost of the compromises that Clay promoted are palpable in the vicious treatment Northrup had to endure—made possible, Brands implies, by laws in both the South and the North. Brands is a fluent writer with an unfortunate penchant for clichés like “nail in the coffin.” Other lapses include a kind of hokey melodrama that, I suppose, is meant to appeal to the general reader who, nevertheless, will cringe, I hope, at certain passages describing what occurred after the deaths of Clay, Calhoun, and Webster: “The ghost of Henry Clay shook his head in sorrow, while John Calhoun’s specter nodded grimly at this fulfillment of his prophecy of escalation against the South.” In other words, the new anti-slavery Republican Party would have appalled both Clay and Calhoun. Or: “John Calhoun’s shade again nodded, this time in approval. Slaveholders poured into Kansas from neighboring Missouri; anti-slavery activists rushed to counter them.” The result was bloody John Brown, just as Calhoun supposed would happen when anti-slavery zealots captured a political party. Brands’s phrasing is not good biographical or historical prose but would make good scenes in a D. W. Griffith silent film. We read history and biography, in part, to see where we come from. And in this case, the debates about sectionalism, trade, and tariffs sound familiar. Clay never did understand why protectionism actually hurt the American economy. Calhoun viewed trade only in terms of what it meant to his constituents. Webster went beyond the sentiments of his region, but he lost support, as a result, among his own political base. Brands does not point to parallels with the present. He is confident enough to know that we will find them. Carl Rollyson is the author of American Biography and the forthcoming This Alarming Paradox: The Life of William Faulkner.